Let’s face it, this time of year can get nutty (with a capital N) and expensive as we try to dazzle our friends and family with meaningful gifts, intent on showing them how much we care. You don’t have to break the bank though, to give the runner in your life a special gift (especially your BRF). 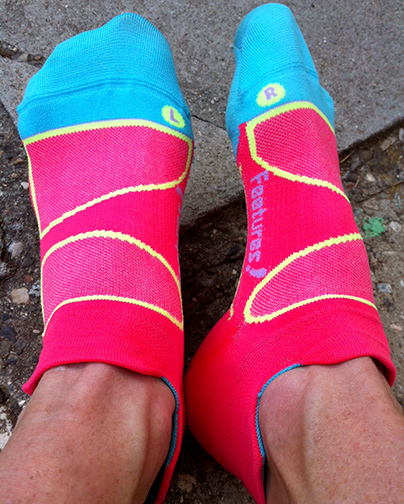 Here are 8 free or inexpensive gift ideas for runners. This is one of my favorite gifts to give. 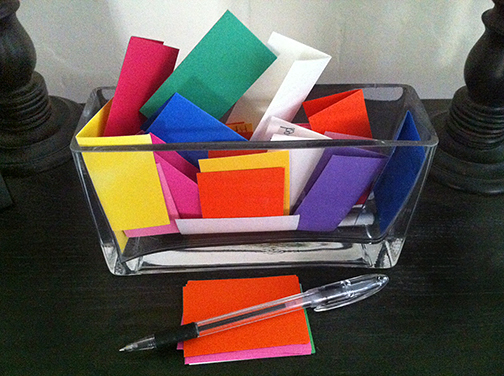 Simply find a clear jar, bowl, vase or large cup and add a pen and a little pile of colorful blank cards. The idea is that every time something good or exciting happens in your life, you write it down on a card and put it in the Happiness Jar. It could simply be, “Dragged myself out the door and ran 3 miles today when my motivation was waning” or “Ran a PR!” or “Went for a wonderful run with ____.” As the year goes on the jar becomes more and more colorful, reminding you of just how lucky you are. Gratitude bubbles up every time you look at it. And here’s a bonus: the recipient will always think of you whenever she adds a happy note to the jar because you are the one who gave it to her. Frame a photo from her favorite race or run, or even a fun selfie you snapped together on a run. Capturing the spirit of her love of running will keep her going all year and celebrate your friendship and her fitness. Do your research and troll through the web for all the races in your area for the year. Hand-pick ones you know she’ll love. Even better, highlight ones you’d like to do together. Give it a spunky personalized title like, “Becky’s Badass Running Year Ahead” and print it out on pretty paper. Throw in a few of her favorite gels or chews and you’ll set a fun tone for the year ahead. This is another visual celebration of fitness and running, and an especially exciting gift for runners who are just starting out or who need every type of motivation possible. Simply give her a pretty jar and a big bag of marbles. Every time she runs a mile, she gets to put a marble in the jar. This jar represents her fitness, determination, and progress. By the end of the year, it will be filled with hundreds of marbles. You could also substitute marbles for pennies or any other item that might match her personality. This may sound a little sappy, but simply putting into words what your running partner means to you is one of the simplest and most meaningful gifts you can give. Be specific. Remember details about certain runs. Celebrate the qualities you appreciate most in her. Just like you leave it all out on the road or trail, leave it all out in this letter. Want to take it up a notch? This is an especially nice gift to give with a bottle of wine or a bag of her favorite coffee or tea. While she’s sipping away, she can linger over your sentiments. This is great idea for those who could use a little inspiration in the meal planning department. Simply gather up your favorite healthy recipes, print them out on pretty card stock and tie them with a ribbon. From smoothies to entrees to healthy desserts, the possibilities are endless. Your creativity is what makes it so special and useful. Want to elevate it a little more? How about including a coupon for a healthy home-cooked meal delivered to her door? Or how about wrapping up some homemade granola or a healthy dessert? In our town we can purchase tokens from our Farmer’s Market, which can then be used like cash at our various weekly markets. It’s fun to give tokens in a little cinched bag with a ribbon. It’s also a perfect complement to the healthy recipe gift idea above. • Babysitting when she’s in a bind and needs a last-minute babysitter so she can go for a run. We’ve all been there, right? • Driving her to a race to be a support/logistics person (cowbells and signs included in package). 1) Pedicure. A runner’s feet take a beating. A little pampering goes a long way. 15) Necklace, earrings or bracelet with running theme. 1) Waterproof iPod Shuffle–especially great for swimming cross-training. (This is on my personal wish list)! In the end, regardless of the price tag on your gift, it’s the sentiment that matters most (duh). Here’s to gifts from the heart and celebrating the awesome runners in your life! Now get out there and run…that’s the best gift of all…especially to yourself! When you come back, swing by again and tell me what’s on your Holiday Wish List or share the best running gift you ever received. Thanks Whitney. I’m happy to see the running group you and Jamie are starting in the new year!! Go Moms in Motion!